With Thanksgiving a little more than 2 1/2 weeks away, I have been making Christmas cards. I just love this SoftPencil Studios image. That little house is fabulous! And who could resist Ratiny hiding behind a little snow bank? 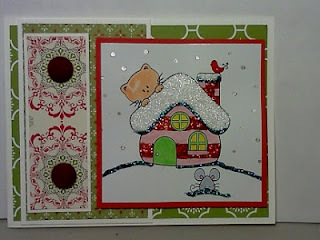 I mixed and matched SoftPencil Studios images with my Stampin' Up! dsp, a couple of brads and stickles. It works because SoftPencil Studios images are so versatile. Visit SoftPencil Studios and get cha some! Be sure and check out the rest of the DT projects this week and if you'd like to get in on the fun with any of the SoftPencil Studios Products just click HERE. This is so cute. I love all the glitter.